Chalk up the Nov. 21 rescue of two Australian men in the open ocean to infrared goggles that allowed airborne searchers to see signal lights on their life vests in the dark. Yesterday, a Coast Guard crew showed off the infra-red goggles, known as "aviators night vision imaging system." The infrared goggles "definitely increased their odds a great deal," Petty Officer 1st Class Bill Tuohy said. yesterday and spoke about the ordeal. Raymond Clamback, 63, of Sydney, Australia, and Shane Wiley, 50, left Santa Barbara, Calif., in the new Piper Cherokee Nov. 20. The plane went down Nov. 20 after losing oil pressure when the two were on the last leg of delivery of the new plane from Florida to a customer in Hilo. After ditching, the two men stayed close together in the rough seas until a passing boat picked them up. Clamback met the Coast Guard C-130 aircraft captain and crew that spotted him and his passenger nearly 10 hours after their new plane lost power and ditched some 300 miles east of the Big Island. "I wouldn't be here today if it wasn't for these guys," Clamback said at yesterday's Barbers Point meeting, recalling the hypothermia he and Wiley experienced but survived without hospitalization. "A rescue like this reminds me why I joined the Coast Guard," said Capt. 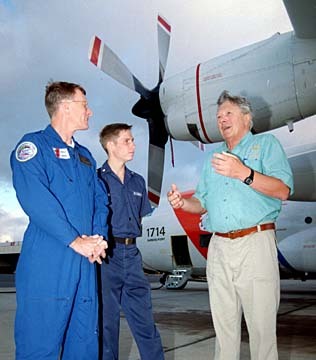 Roger Whorton, who flew the Coast Guard C-130. The sighting was made by Petty Officer 3rd Class Shane Reese about 1 a.m. that morning. "If we didn't have the night vision goggles, there was really a good chance we weren't going to find them," Reese said.